People always told me how great I would feel once I started taking medication. However, no one told me how difficult it would be once I tried to quit. It was March 2016 when I finally got diagnosed with depression. Truth be told, I had been struggling with it for many months prior (and off and on for years prior to that), but it wasn’t until that day in March that I spoke to my doctor and got official word that my symptoms resembled anxiety and depression. Ironically, that was the day I started feeling better. Perhaps it was because I finally had hope that things would get better. Maybe the depression had finally run its course. I’m not sure. But I specifically remember walking out of the doctor’s office with a smile on my face…and a prescription in my hand. Little did I know what that prescription for 10 mg of Lexapro would bring with it. Before I continue on, let me make clear I am in no way anti-medicine, anti-antidepressants (is that a thing? ), or about to discuss the overwhelming drug epidemic in our country. That’s a conversation for another time. The truth is that small white pill worked–not immediately, but over the course of the next several weeks I gradually felt better. It was doing what it was supposed to do. It did carry some side effects, like weight gain and headaches early on, but I soon adjusted and felt better than I had in a long time. My mood was better, I was sleeping better, and life was better. As we fast forward three years, I’m happy to say I’m doing great and depression seems far behind me (though many of us know it has a way of sneaking up when we least expect it). And because I’m doing better, my doctor has given me clearance to start tapering off of Lexapro. That’s a great thing…until it isn’t. When it came to depression, people always told me how great I would feel once I started taking medication. However, no one told me how difficult it would be once I tried to quit and the withdrawal symptoms set in. Here I sit on January 21, 2019, six months into the withdrawal process, and it’s not too pretty. My dosage has dropped from 10 mg to 2.5 mg (I’m basically swallowing dust), and yet I haven’t been able to completely stop. Each time I’ve reduced my dosage, I’ve experienced headaches, lightheadedness, and increased irritability. On some occasions, anger and rage have accompanied the withdrawal process. In doing some research, I found out I’m far from alone in this process. Many others experience these same symptoms, and even to higher degrees. Some described not being able to sleep. One described having rage so bad that he ripped off a paper towel dispenser in a public bathroom. Many others said they had changed from a calm person to Captain Road Rage in a short amount of time. I even found out that some people have had to enter 30 day rehabilitation centers just to deal with the withdrawal effects of Lexapro and other SSRIs (selective serotonin reuptake inhibitors). I’m extremely thankful my effects haven’t been that severe, but I do have sympathy for those dealing with the aftereffects. There are a lot of factors in play, but withdrawal symptoms from Lexapro and other SSRIs can usually last 90 days and sometimes even up to a year. That’s a bit scary. So what’s my point? It’s definitely not that you should avoid all doctors and medication when it comes to depression and anxiety. I’d preach the opposite of that. Talking to my doctor about the issue was one of the greatest things I’ve ever done, and right now I’m currently taking Wellbutrin, which doesn’t seem to have any side effects, and it’s also supposed to help me “stop smoking” (Mission accomplished! 34 years and counting… ). Here’s what I want to get at: The world is starting to open up a bit more about depression, anxiety, and other mental illnesses. That’s huge. We need to remove the stigma surrounding these things. But we can’t just stop there. Once people seek help and treatment, we need to stay with them through the process and be active listeners and humble encouragers. Simply getting them to the doctor does not fix the problem. A single pill does not fix the problem. In fact, a lot of people feel worse after getting on medication, and it can take time to find the proper medication and dosage. I’d like to encourage anyone reading this to go the extra mile when dealing with these issues. If you’re struggling with anxiety and depression and have seen a doctor and obtained medication, don’t feel like something is wrong if you don’t feel perfect. Don’t feel like you’re messed up if the medication is causing weird side effects or you just don’t feel like yourself. If your dosage changes or you’re tapering off, don’t be hard on yourself if you feel likes changes are happening that you can’t control. And if you love someone who is dealing with these things, walk with them through it. Our culture is getting much better with encouraging people to be open about their mental illness and to seek treatment. But the conversation can’t stop there. Seeking help and treatment is only Step 1 of the journey. Be a person your friends can talk to honestly and openly. Listen more than you talk, and when you talk use your words to ask questions, facilitate honest conversation, and encourage. I’m thankful for the effect medication had on me. I’m struggling with the way it affects me now as I try to kiss it goodbye. No one ever told me about this part of the journey. If you’re on it, know you’re not alone and I’m walking it with you. 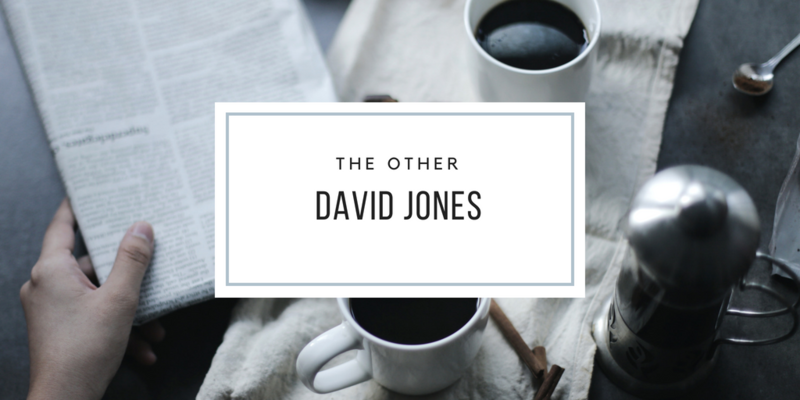 The Other David Jones Powered by WordPress.com.